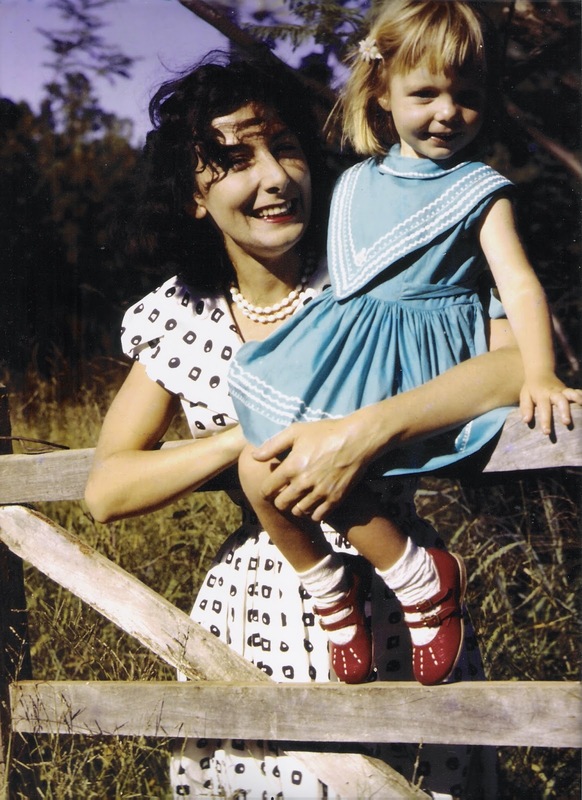 This is a photo of my lovely mother, Sheila, and me when I was little. I LOVE her dress... and I so wish I had a waistline like hers! And the dress I am wearing was made by her with her Necchi Sewing machine, which is still working, 50 years later! One year ago today my mother passed away. She was a very talented lady, a great sewist (she would have been amused by that word) a great poet, wonderful cook, and the best Mum my sister and I could ever wished to have had. She made ALL our clothes when we were young. Matching dresses when we were very little, with big gathered skirts and bows that tied at the back. Lots of cute 60's shift dresses when I was younger, in the 70's we had hot pants, see through blouses ! (What a little tart I was!) Christmas Day was always special, one year she stayed up till the small hours making stuffed toys for us. A lovely pair of grey donkeys. I don't know where she got the energy from. My Mum had a great owl collection. She loved owls, and was "Speckly Owl" when she was a Brownie Leader. It started with a few, then everyone gave her so many! And her favourite flower was the poppy. So gifts were easy, if it had a poppy on it, Hooray! And as for the poetry she was constantly thinking up some funny rhyme, and every year we all got a Christmas "Rhyme-a-line". For many years my parents lived in the rural districts of Natal, South Africa, where she and my father had Watersong, a Trout farm and cottages for fishermen to stay in. Being so far away from the nearest town made them very resourceful. 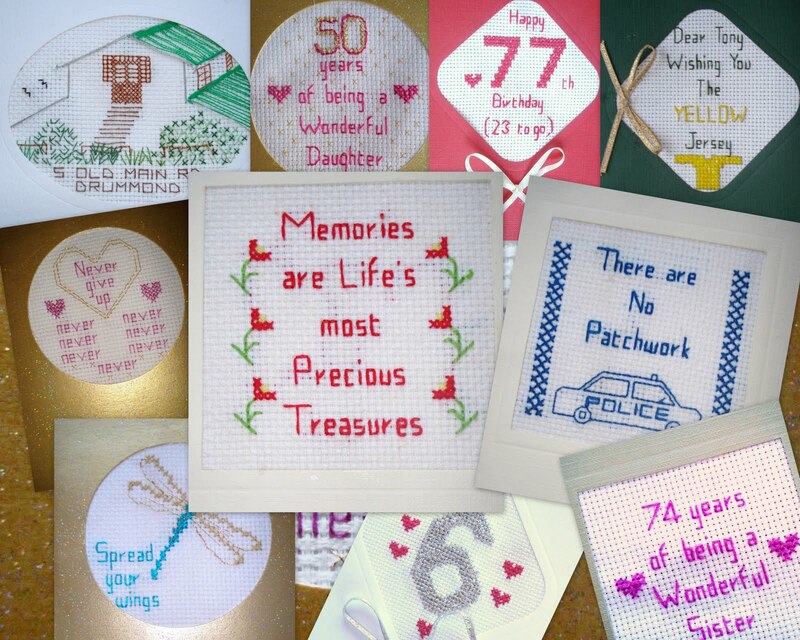 One very special thing she would do was to embroider a card for us on our birthdays, and any special event. She must have made hundreds. I so wish I could hunt them down and compile a book. My poor Mum got Multiple Sclerosis. It was horrible, and over a long period, she got worse and worse. The right side of her body just stopped working. My Mum was a fighter. She never complained, and refused to ever think that she would not be able to walk. Her theme song was "I'm still standing" by Elton John. She sat in the lounge every day, watching TV, sewing cards for us all. Now, that was a bit of a challenge, because she completely lost the use of her right hand side, so had to learn to sew , and write, with her left hand. She would keep my forgetful father on track, reminding him of TV programs, telephone numbers, and shopping lists. She recited recipes to him and he would make them in the kitchen. One day she was stitching a card that said "out of sight, but never out of mind" for someone. She got as far as "out of Sight..." and, then her eyes gave up. She had macular degeneration, and she just couldn't see the fabric any more. She really missed her sewing, and had to resort to listening to stories from tape Aids for the blind, but most of the time they sent her to sleep! I went to visit her for her 80th Birthday. It was lovely to be home again. Sadly, a few weeks away from her 81st, the horrid disease claimed her. "You never know what it will be, but Something is going to get you"
"If I 'pop off', don't be sad. I can't stand the idea of ending up in a frail care facility"
So I try not to be sad, and remember how lovely she was. Mother had some secrets too. With simple home made remedies. Then night time, hot fresh lemonade. After custard powder, eaten raw. A rub with butter eased the lumps. And soon they were all right again. With soap and sugar, mixed together. With the old hot water bot. Was Mother’s Tender Loving Care. I am wearing my long skirt, the one with the red flowers on a black background, the red top that matches and the silk scarf from Indonesia. I will get in the wheelchair, go down the ramp carefully, up the drive to the gate where the tibouchina tree sheds it’s purple blossoms on the ground. Then I will turn right and travel past the poinsettia bushes on the verge, past Alison’s house, where Sam and Ben will bark in greeting Then on down the road, not seeing a single person on the way, until I get to the intersection. On the right is the Fainting Goat so I will keep near the pavement and make my way to the wooden tables under the palm trees. Then a waiter will come to take my order and I will sip my coffee and watch the cars drive by. But it won’t be today. It is three in the morning and I can’t get to sleep so I plan my adventures. The wheelchair is without batteries at the moment. They were taken out to make it light enough to go in the car, and yes, I did go in the car a few times, mostly to see health specialists. But now I’ve been housebound for a while and need to go out. I’ve been diagnosed with MS. This is a medical condition where there is demylianation of the nerves. It is likened to an electrical system with broken covering on the wires. The electricity won’t get through and with MS the messages from the brain don’t work. I can say ‘Come on leg’ as much as I like but it stubbornly refuses to obey so gets dragged around. My right arm won’t work either. I was in Barbara’s sitting room in July 2006 when the doctor phoned to tell me the news. . Most of the conversation is now a blur. The thing about MS is that up to now there is no cure. You just have to get on with life. I’m so lucky my husband looks after me. I wish I could be independent. So that’s why I have this plan. Well, the batteries went back into the wheel chair but we moved house before I could take myself off for coffee at the Fainting Goat. But I do want to go one day. I’ll let you know when, and perhaps you will join me? Linda, this is beautiful. Your mother sounds extraordinary, and I really appreciated this brief chance to meet her. Thank you.